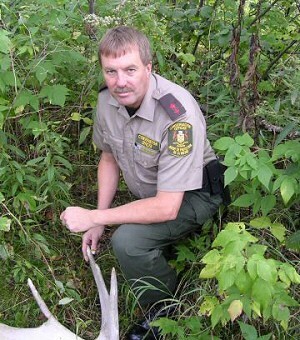 Gerry Van Leeuwen, the District Enforcement Supervisor in North Bay District, was chosen as Ontario’s 2003 MNR and OCOA Conservation Officer of the Year, based upon 28 years of outstanding service. A selection committee consisting of field and main office staff, and representatives from the provincial enforcement program and the Ontario Conservation Officers’ Association (OCOA) selected this year’s winner of this very prestigious award. Gerry (Gerard) Van Leeuwen is currently the District Enforcement Supervisor in North Bay District. He has been appointed as a Conservation Officer for 28 years. After holding a DCO appointment in Niagara District from 1974-1975, he was appointed as a CO in Red Lake District, and held that position from 1975 to 1984. In the fall of 1984 he moved to Temagami District and worked as a CO out of the New Liskeard satellite office. For a year in 1989-90, Gerry tried a T&D as the CO Coordinator for Temagami District. He went back to his field CO position for a few months in 1990 before successfully competing for the CO Coordinator competition for Temagami District. Gerry has held that position through its evolution to Compliance Specialist in Temagami District, and assisted by doubling as the North Bay District Compliance Specialist for two years into 1996. 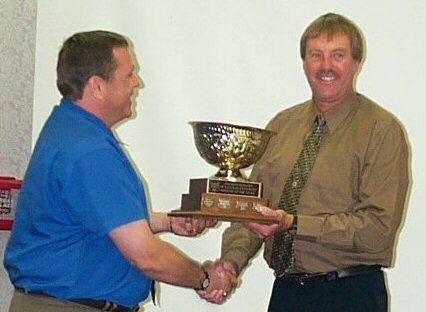 When Temagami and North Bay Districts amalgamated during reorganization in 1996, Gerry won the competition for North Bay District Enforcement Supervisor and has held the position since. Gerry has a character of the highest integrity. He has been, and continues to be, a role model for many aspiring and newly appointed officers. Gerry completed the MNR Prosecutor’s Course in 1988, and has been prosecuting cases in court for Conservation Officers ever since. He has gained a reputation as a knowledgeable and capable advocate of natural resources law enforcement. After locating one of the first Peregrine Falcon nesting sites in the Temagami area, Gerry became heavily involved in that species’ rehabilitation efforts. He represented Ontario at the National Peregrine Falcon Recovery Team meeting in the fall of 1993, and helped get Temagami involved in the hacking and release project. In 1999 he was a member of the Ontario Team that received the P.R.I.D.E Award for Excellence in Leadership for outstanding dedication and commitment to the ongoing recovery of Ontario’s peregrine falcon population. During his career Gerry has demonstrated competency and knowledge by actively training other staff. He has been an Instructor for First Aid, Fire Investigations, CFSA, Aquatic Habitat, Work Permits, and has trained many CO candidates on the DCO and Level 1 CO courses. Gerry has always been a promoter of natural resources management and enforcement, through both public education, and committee work. He has given countless presentations to schools, trapping, hunting, fishing and environmental groups. He participated in the exercise to create the CFSA (Crown Forest Sustainability Act). Over the course of 1995-2001, he was an executive founding member of the Tri Town Crime Stoppers Board, served on the North Bay Crime Stoppers Board, and was on the planning committee for the May 2000 Provincial Crime Stoppers Convention in North Bay. Gerry epitomizes the highest standards of professionalism on a daily basis from the way he wears his uniform to the way he conducts himself both inside and outside the office. In often highly charged enforcement situations he has a way of talking to people that will at the same time diffuse a tense situation, achieve the goal and leave the person with their dignity. He is very dedicated to the job of Conservation Officer and has on many occasions put his job before all else. Gerry was an active member in good standing of the Red Lake Lions Club (1979-1984), New Liskeard Lions (1984-1996), and the Widdifield Lions (1996-2001). During his 23 years involvement with Lions, he held many executive positions. 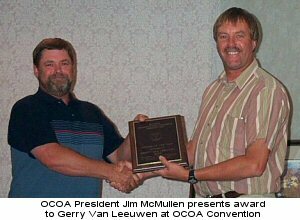 Gerry has been an active member and participant in the Ontario Conservation Officers’ Association almost since it’s inception. He joined the OCOA executive in 1988 as both the Northeast Regional Rep and the OCOA Treasurer. In 1990 he added Memberships to his Treasurer portfolio, and continued in that dual capacity for 10 years. He and his wife Kate continue today devoting numerous hours to maintaining the OCOA’s Memberships. Gerry and Kate have participated in almost every OCOA Convention and have made many trips to the international NAWEOA Convention as Ontario CO representatives. Gerry and Kate have always been known open their home to injured or orphaned wildlife when rehabilitation and some TLC were needed to release the animal back to the wild. Gerry has, and continues to sit on, a number of provincial committees. Gerry has been and continues to be a driving force behind the re-introduction of peregrine falcons into the North Bay district. He has located and protected a number of wild peregrine nesting sites ensuring that they can nest and rear their young undisturbed. In addition to receiving the Ontario Conservation Officer of the Year Award, and being selected as the OCOA Officer of the Year, Officer Van Leeuwen will receive the Ontario Shikar-Safari International Award, and the Midwest Association of Fish and Wildlife Agencies (part of the International Association of Fish and Wildlife Agencies) Officer of the Year Award. Officer Van Leeuwen was presented with Ontario’s Conservation Officer of the Year Award at the OCOA Convention in Thunder Bay in August. These presentations and awards reinforce the high quality of staff that both the MNR and the OCOA are proud to have working for the OMNR enforcement program.